Tomorrow, Friday, February 22, is the closing date for nominations for Gradam Sheosaimh Uí Ógartaigh - Galway’s bilingual business award. To enter, simply fill in the application form available online at www.gleg.ie, or pick up a form at Gaillimh le Gaeilge’s office on Flood Street, free of charge. The Gradam is open to businesses/organisations which are registered and doing business in Galway City which are not primarily involved in the promotion of the Irish language or subject to the Official Languages Act 2013. There is no cost to enter and you can also nominate a business or organisation for the award. Gaillimh le Gaeilge will work with you every step of the way to help you incorporate ‘An Ghaeilge’ into your business so, do not worry if you are not a fluent speaker. Businesses and Organisations can enter one of four categories; Retail, Hospitality and Tourism, Services and Other Companies. A winner will be chosen in each category and the overall winner will be selected from the four category winners. Emma Dillon-Leetch, Sales and Marketing Manager of the Connacht Hotel, winners of Gradam 2018, encourages any business or organisation to enter. Speaking about the Gradam process, Cathaoirleach Ghaillimh le Gaeilge, Bernadette Mullarkey said she is delighted with the interest in Gradam Sheosaimh Uí Ógartaigh so far this year. Gradam Sheosaimh Uí Ógartaigh is named in honour of the late Seosamh Ó hÓgartaigh, founding member and company secretary of Gaillimh le Gaeilge. It is organised by Gaillimh le Gaeilge in partnership with the Galway Advertiser and with support from TG4 and the Galway Chamber. 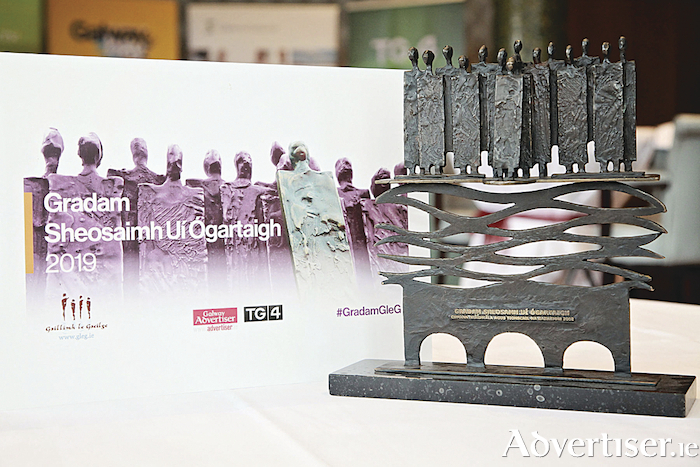 Now in its 17th year, the Gradam, recognises and celebrates companies and organisations in Galway city that use the Irish language in their day-to-day business. At the official launch of Gradam 2019 recently, Méara Chathair na Gaillimhe, an Comhairleoir Níall McNelis announced the sponsors for the year ahead - The main media sponsor of the Gradam is once again Galway’s favourite and most widely read newspaper, the Galway Advertiser. TG4, an stáisiúin teilifíse a thugann ‘Súil Eile’ ar an saol agus lonnaithe i gceartlár na Gaeltachta have also renewed their sponsorship for the overall winner. This year, Gaillimh le Gaeilge is delighted to welcome a new sponsor on board and they are; MOLSCÉAL. Developed by TG4, MOLSCÉAL is the first ever app that provides short form video content for the Irish language speaking community all in one place. Gradam Sheosaimh Uí Ógartaigh will feature on the app over the coming months. The Category sponsors are as follows: Galway Bay FM, Fáilte Ireland, Snap Galway and Acadamh na hOllscolaíochta Gaeilge, Ollscoil na hÉireann, Gaillimh. Údarás na Gaeltachta and the Galway Chamber are also providing sponsorship to the overall winner. The total value of the prizes and benefits is over €23,000. The Gradam Gearrliosta will be announced by Méara Chathair na Gaillimhe, an Comhairleoir Níall McNelis on Tuesday April 16. The Gradam culminates with a Gala Award Ceremony in May when the category winners and overall winners will be announced. The closing date for entries is tomorrow February 22 2019. Ag súil le cloisteáil uaibh! You can follow Gaillimh le Gaeilge on Facebook, Twitter and Instagram.